Here is my Week 13 of the Documented Life Project. someone else was to start a drawing and we were to finish it. I immediately wanted to use some of my kid's artwork. But my kids are all married and live in different cities. from when they were younger. Awwww. I am so glad I saved these. I am thrilled to have these included! I reduced the sizes on the photocopy machine to all fit on the inside of the flap. and she said she would draw me an ugly face! by Andrea Matus DeMeng... 6x6" Thanks A Lotus. Go Here to see the blog post on that. The challenge for Week 14 was to write our name and embellish it. I cut my name out of painted and inked up deli paper. I played with colors and patterns. variety of pens and markers. I used a tag with my name on it I received in 2012 for my flap. The lace on the edge was already attached. And I love the little free spirit horse and winged heart. I repeat my favorite motifs alot! My traced hand is also something I repeat often. There were times I had no idea what direction to go. So I would trace my hand and do art around it. those who really ARE artists is their body of work. I learned to just DO ART. Do Something. Get your Hands Moving and the Colors Flowing! Just SHOW UP and DO THE WORK. To finish it off I used the sparkles stamp from the RubberMoon Mail Club. And I love my DLP! Hi Janet. I recently joined the DLP and I'm working on some pages. 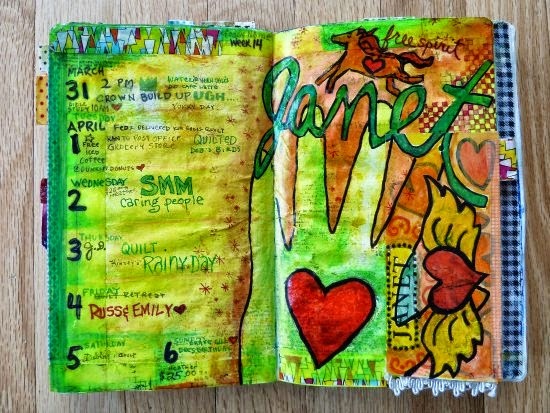 I noticed that you and others fill even the weekly calendar part of the pages with color. What do you use to color those pages? Is it crayons, wc pencils, markers? I would like to color my pages, but I'm not sure what to use that won't go through to the other calendar pages. Help. Thanks. Linda E.
Hi Linda! Welcome aboard the DLP train! Hahahaha..... I think everyone does it different...it is personal preference...but I will tell you what I do. Every inch of thin moleskine paper is covered with a thin layer of gesso or mod podge or white paint or a mixture of any of those. Then pretty much any medium can go over that without bleeding through to the next page. I CRINGED when I started, afraid I was ruining the book. But it works!!!!! I like to use markers or gel pens or posca paint pens or Sharpies or Neocolor II crayons. If you DON"T want to use a gesso type of coating, then I would stick with colored pencils or gel pens that won't bleed through. Someone was saying Tombow markers don't bleed through. Other gals were saying they use the Neocolor crayons and then rub a damp baby wipe over them to blend the colors smooth. Good luck! And have FUN! I think this is a GREAT project!